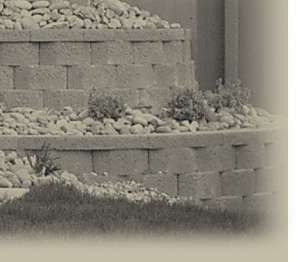 Retaining Wall Builders, About Cornerstone Retaining Walls, Inc.
About Cornerstone Retaining Walls, Inc.
Let me introduce myself. My name is Clint Pino. 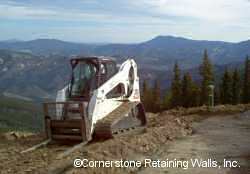 I’m the Owner and Operator of Cornerstone Retaining Walls. I spent my childhood on a Minnesota dairy farm learning first hand that hard work and attention to detail are essential to success. My childhood experiences instilled a strong commitment to work ethics in me that has lasted throughout my life. That’s why the cornerstones of my own company are experience and ethics. The mission of Cornerstone Retaining Walls is simple and clear. I pledge to construct retaining walls that will not only last a lifetime, but will also compliment the surrounding landscape. I strive to be on time, every time; and to work within your budget. I promise to deliver beautiful results backed by dependable service at affordable prices. I accomplish this through the knowledge and experience I’ve gained from 19+ years in the retaining wall construction business in the unique Rocky Mountain, Colorado environment. I also draw on my abilities and over 30 years experience with operating various types of machinery and equipment. I build each and every retaining wall and patio as though it would bear my name for everyone to see. No shortcuts, no excuses. I’d be glad to offer you a free quote* on your upcoming retaining wall or paver project. Please use the contact information below to reach me via email or phone. *Please note that the free quote only applies if you currently own the property with which you desire to have a retaining wall or paver project installed. If it is for a property you are thinking of buying, I do charge a nominal fee to come out and look at it and give you a quote. Arvada, Aurora, Bailey, Blackhawk, Boulder, Breckenridge, Brighton, Castle Rock, Castle Pines, Cherry Creek, Cherry Hills, Central City, Commerce City, Conifer, Dillon, Englewood, Evergreen, Fraser, Genesee, Greenwood Village, Glendale, Golden, Greenwood Village, Highlands Ranch, Idaho Springs, Lafayette, Lakewood, Littleton, Longmont, Loveland, Lyons, Morrison, Nederland, Northglenn, Parker, Pine, Sheridan, Silverthorne, Tabernash, Thornton, Westminster, Wheat Ridge, & Winter Park. Adams County, Arapahoe County, Boulder County, Clear Creek County, Denver County, Douglas County, Gilpen County, Grand County, Jefferson County, & Summit County. 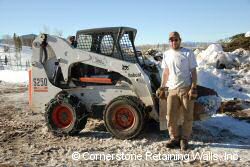 Cornerstone Retaining Walls, Inc. serves the Denver, Colorado metro area. ©2002 - 2019 All Content Protected By US Copyright Laws. All Rights Reserved.